1. Art and Environment Workshops, Tours, and Lectures. Paula is a painter, illustrator, and builder of green playgrounds. She lectures at School of Visual Arts, The Museum of Modern Art, Brooklyn Book Festival, Cooper Union, Department of Sanitation, DEP facilities,skate parks + gardens. Paula is a comic book artist, cartoonist, and illustrator. Since 1984 Paula has edited and contributed comics to WW3. She just co-designed this interactive website for WW3, the longest running political comic book in the world. 6. Writing and Research for Youth. Feasibility Studies and Landscape Design Proposals, including Parks, Public Plazas, and Green Roofs developed with youth. Since 1993 Paula has led Feasibility Study teams, written articles and proposals and raised funds for the construction of public projects for the DEP, NYC Parks Department, DoE, Trust for Public Land, and Open Road. 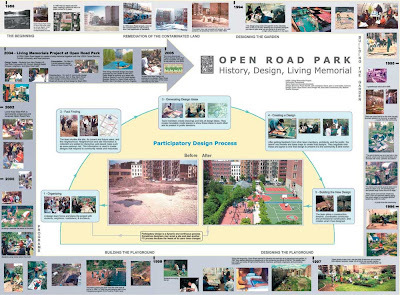 Since 1999 Paula and Open Road have helped create this mapping site with youth. Art, photographs, comics, digital art, architectural drawings, and sculpture.